Dosage: 3 to 10 % diluted in water. ECOCLEAN GT-DN is a is a degreaser solution designed to clean for ferrous metals in ultrasonic systems. The ECOCLEAN GT-DN formulation includes sequestering agents that prevents the sedimentation of calcium and magnesium salts when using hard water, without affecting the cleaning performance. The surface-active agents, which have been carefully selected, grant the detergent degreasing properties and help to loosen the contamination. The ECOCLEAN GT-DN formulation also includes wetting agents that help reduce surface tension. Does not contain NTA, cationic surfactants, ethoxylates or nonylphenol ethoxylates. This product has been made using water purified through reverse osmosis. 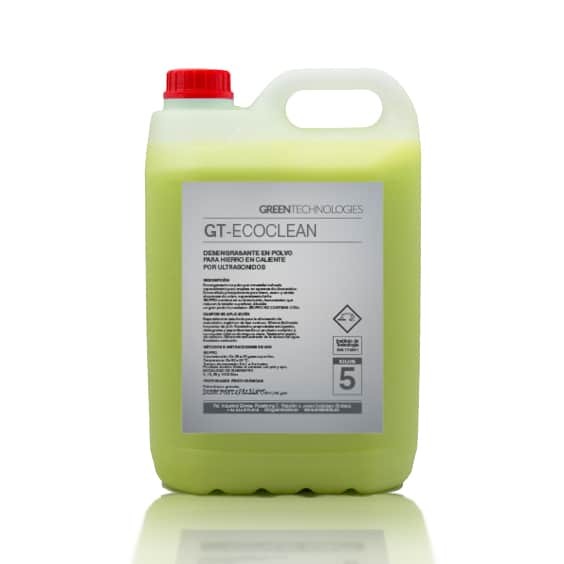 ECOCLEAN GT-DN is a detergent solution designed to be used in ultrasonic baths within the automotive industry and industry in general. ECOCLEAN GT-DN can be used diluted in water to a concentration between 3% to 10% according to the method use and the contaminants to be removed. It can be used in immersion baths, with a brush or cloth. The cleaned piece must always be rinsed after. Within the food industry it is mandatory to perform a thorough rinse when used to avoid leaving any detergent on the surfaces.